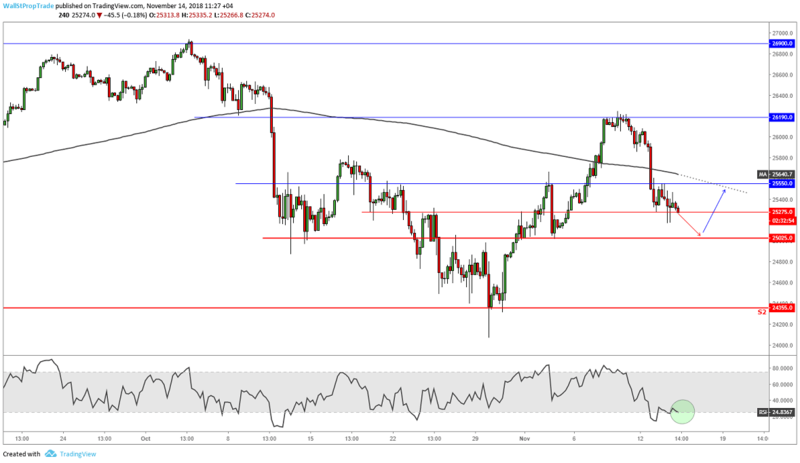 Following the sell-off seen in the previous session, the Dow spent the day bouncing back and forth across the unchanged line, before falling 100 points towards the end of the session closing the day at 25,286. Traders obviously continue to express uncertainty about the global economic outlook and the impact of an anticipated increase in interest rates, and are reluctant to make more significant moves ahead of the release of closely watched reports on consumer price inflation, retail sales and industrial production in the coming days. Moving lower for the 3rd day in a row, the Dow Jones stock index was unable to hold its gains as the bears took control ending the day 100 points below its opening price. Looking ahead, the market shows strength in the medium-term supported by its long-term uptrend and a key technical support level at 25,025 with only the short-term trend being bearish. The RSI looks bearish for now, although in the next few hours if prices keep dropping the indicator will most likely signal oversold conditions triggering an upward rally.